I never intended this site to be used for the general discussion of cats, but Flora’s litter (discussed below) included a disabled kitten, and I thought it would be useful to share our experience. As soon as the kittens began to walk it was clear there was something wrong with Fireboy, the little black-and-white one (named after his dad, Fireman, who he so closely resembled). 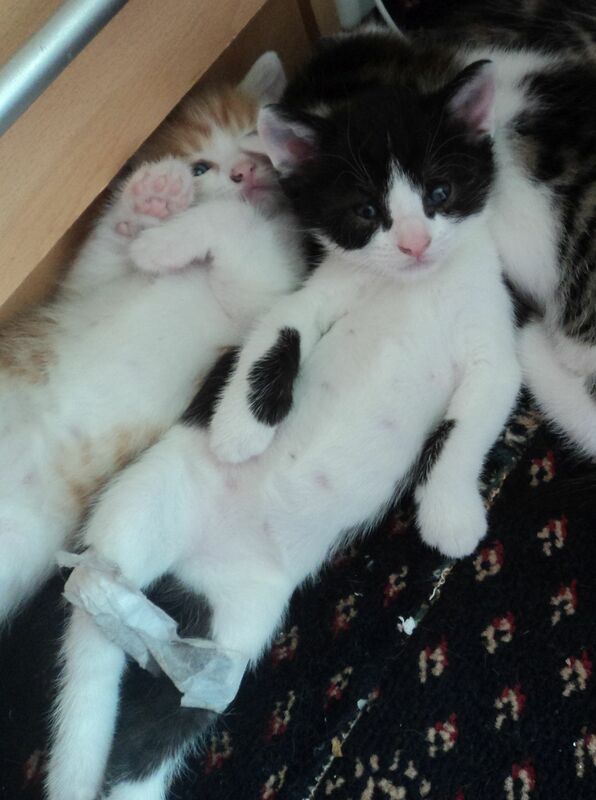 Unlike the other kittens, Fireboy could not seem to get his back legs up. He dragged them around rather like a frog’s: they seemed weak and undeveloped. We considered taking him to the vet, but with the cost of consultations so high, checked out the web first. There we came across the condition known as Swimmer Kitten Syndrome, whose symptoms closely matched Fireboy’s. According to some articles, vets had recommended putting down kittens with this problem, which is probably caused by a lack of space in the womb. However, some cat owners claimed to have cured the condition either by taping the legs together or making a sling with which to hold up the back legs. We rejected the latter idea as we did not have the time nor energy to walk around supporting the back end of a kitten all day long. However we tried the former. We bought microporous surgical tape, about 2cm wide, and I wound it around the bottom part of Fireboy’s legs, joining them together so that they were about 4cm apart – tight enough to prevent his feet from sliding outward, but loose enough for him to get about. Needless to say, Fireboy was not keen on this at first, but he soon got used to it. With his hips now in the right position, all his running and climbing was now strengthening the muscles and teaching him correct movement. After eight days I took the tape off and hey presto! He was walking upright. His feet were still rather splayed and his haunches smaller than his siblings, but continuous exercise seems to be rectifying things. He’s a fabulous little kitten, probably the most adventurous of the bunch, and a lovely looking thing to boot. So there we go: swimmer kitten syndrome, as others have claimed, is a curable problem. Maybe if I get around to writing a sequel to The Last Free Cat, as so many have urged me, this experience could be incorporated into that fictional world. For more about my 50+ children’s books, including Thimble Monkey Superstar, shortlisted for the 2017 Lollies (Laugh Out Loud awards) check out my main website.